Following the recent violence in Gaza, the complex challenge posed by grassroots militant organizations such as Hamas in the Gaza Strip is poignantly clear. In Lebanon, the militant Shi'ite group Hizbullah, which fought another war with Israel in 2006, presents a similar conundrum for the Obama administration. Hizbullah is certain to fare well in upcoming parliamentary elections, possibly echoing the January 2006 Palestinian elections when Hamas won a commanding majority. Hizbullah hardly resembles a liberal-minded force for change. The inherent contradiction of an armed militia winning free and transparent elections is obvious. Hizbullah's democratic tendencies and its commitment to political reform are certainly suspect. Moreover, Hizbullah has benefited from Lebanon's weak central government, showing little apparent interest in strengthening state institutions. 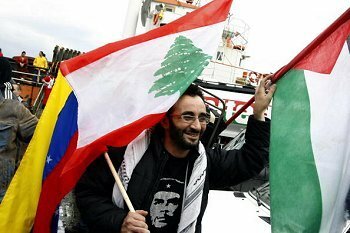 Meanwhile, many Lebanese take great issue with Hizbullah's reckless decision-making, taking Lebanon into a war with Israel and two years later turning its arms on fellow Lebanese. And, of course, Hizbullah's arsenal – maintained in violation of UN resolutions 1559 and 1701 – constitutes a key point of contention. Yet, Hizbullah, with its deeply-entrenched grassroots support, is the most credible representative of Lebanon's Shi'ites, the largest community in Lebanon's volatile confessional mix. Hizbullah's dual nature as both an armed resistance group and a popular political and social movement underscores the ambiguities. Its supporters view it as both clean – devoid of corruption – and competent, providing key social services in the absence of an effective Lebanese state. It is, in effect, the most powerful representative of Lebanon's largest community. As such, Hizbullah cannot simply be ignored, ostracized or replaced. Hizbullah's continued ascendance – particularly since the Israeli and Syrian military withdrawals in 2000 and 2005, respectively – suggests that the tectonic plates have shifted, reflecting a new demographic and political reality. Unfortunately, Lebanon's power-sharing agreements – first in the 1943 National Pact and later with the 1989 Ta'if Accord – have not always reflected dynamic population trends. So far, attempts to recalculate Lebanon's power-sharing formula have largely been achieved through violence, most notably the 1975-1990 Civil War. Policies bent on disenfranchising or quashing any one community – Christian, Sunni, Shi'ite, or Druze – will insure the continuation of violence and instability. The June 2009 elections provide an opportunity to address these issues peacefully and, if accompanied by appropriate reforms, could help put Lebanon on a path of peace and stability. As such, the key question is: "How to integrate Hizbullah politically and turn it away from its resistance mode toward being a fully-vested political player in the Lebanese arena, while integrating its armed faction into the national security apparatus?" From an American perspective, the answer to this question requires nothing short of a complete paradigm shift vis-à-vis policy in Lebanon. Following the euphoria of Lebanon's 2005 Cedar Revolution, Washington fell far short in helping the Lebanese to build on that momentous achievement by focusing its efforts on defeating Hizbullah at any cost. After months of political paralysis and violence, Lebanon came to the precipice of civil war last May, only to pull back with the Doha Accord. Looking ahead, the United States needs to move away from policies that promote particular factions within Lebanon's fractious political arena and instead seek to build consensus for reform and reconciliation among all Lebanese parties. Gain a more nuanced understanding of Lebanon's political and demographic realities. Well-crafted policy originates from nuanced, rigorous analysis. United States policy must address Lebanon's evolving confessional makeup, including Hizbullah's role in the Shi'ite community, its intentions and long-term objectives. Under what conditions might Hizbullah evolve into a fully political actor and integrate its arms? To what extent can American policy and actions encourage this shift? Stay above the political fray. Washington should resist the temptation to take sides and avoid getting sucked into the morass of Lebanese politics. Such policies have never yielded positive results and often exacerbate Lebanon's volatility. Focus on state institution-building and broad-based political reconciliation. The Obama administration policies should seek to strengthen state institutions including parliament, the judiciary and the army. The United States should assist government ministries in improving basic services and promote reforms that undermine corruption by establishing accountability and transparency. Washington also should facilitate reconciliation among Lebanon's rival political factions by supporting the current National Dialogue. Finally, the United States should engage with Syria to help promote stability in Lebanon. Ultimately, Syria's longstanding interests in Lebanon must be acknowledged, although such recognition does not translate to ceding Lebanese sovereignty. Specifically, Washington should encourage the ongoing normalization of ties between Lebanon and Syria. Damascus recently opened its embassy in Beirut, a historic milestone. The next, more important steps will be to demarcate the borders and address the numerous treaties governing relations that were signed during Syrian control over Lebanon. Mona Yacoubian directs the Lebanon Working Group at the U.S. Institute of Peace. This article is distributed by the Common Ground News Service.